The Italian word for "soup". Zuppa specifically refers to a type of soup for which the main ingredients are vegetables common to the country. A typical Italian Soup that is considered by many to be the most notable Zuppa would be Minestrone Soup which is filled with vegetables and pasta that are cooked in a hearty vegetable broth. 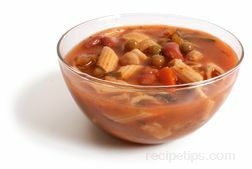 Ingredients for Minestrone Soup may include macaroni, penne pasta or some other type of tube pasta, carrots, celery, green beans, tomatoes, dried peas, garbanzo beans, spinach, onions, garlic, herbs, and seasonings. Another Italian soup served for holidays, gatherings or events, but is not actually a soup served only for weddings is the Italian Wedding Soup. Despite it being a soup that is actually served for events such as marriages, it is simply a name given to a soup that generations of Italians have served for enjoyable times with family and friends. Ingredients that are used for making Italian Wedding Soup may include any of the following: ground veal or pork made into small meatballs with eggs and breadcrumbs, and then cooked in a chicken stock with spinach, parsley, shredded Parmesan or Romano cheese, soup pasta (acini de pepe), celery, carrots, zucchini, minced onions, salt, pepper, seasonings that may be desired.